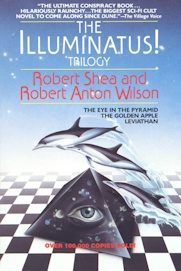 I just finished the The Illuminatus! Trilogy. I toted this tome in my bag for two months, going across the country, coming back, and breaking to read other books. Even though I’ve been very committed to the novel, I’m not sad to see it’s end. I would recommend it, but only if you have a high tolerance for wacky sci-fi nonsense and knowing winks from the authors. But, the reason we’re here (or clicking the back button) right now is to read a list of definitions of words that I picked out of the book. There were many more I didn’t know so well, but we’ll just stick to this short list for now. He spoke with some asperity, since he lived daily with the dread that someday the secret tapes he kept of all Oval Room transactions would be released to the public. In this moment, now, as I tighten the trigger, the tyrant dies, and with him all the lies of a cruel, mendacious epoch. See Pons Asinorum on Wikipedia for a way better explanation. This entry was posted in Writings and tagged definition, illuminatus, robertantonwilson. Bookmark the permalink. That’s interesting, some of these words are really like the corresponding French words. And in French they’re quite common words.